Are you looking for the perfect comfort food? Think cavatelli. Cavatelli is a pasta made into one of the most delicious shapes you will ever lay your taste buds on. But what is cavatelli pasta? This kind of pasta is formed from a semolina dough which is made without adding eggs using a cavatelli pasta maker. This results in a thick and chewy pasta made in a way that sauces that often accompany pasta can stick to it. The value of this pasta is in its scarcity. It was never designed to be manufactured in large quantities. If your plan is to enjoy your cavatelli, then you will have to make them from the beginning. Do not panic yet! This is not a difficult thing to do. You just need to make use of the best cavatelli pasta maker in the market. Later on in this article, three of the best machines currently in the market are overviewed to help you make an informed decision. While cavatelli was originally made by hand, if you are looking for the real deal, then you want to use the right cavatelli machine. Using a cavatelli machine allows you to make the best pasta which is just like the original that is made only in Italy. The machine allows you to make the perfect cavatelli whether you want it smooth or ridged. The machine rolls a trip of pasta when you turn the handle. While cutting the pasta, the machine automatically cuts and rolls the pasta into shape. This ensures a great looking and consistent product. To make your cavatelli better, you need to follow a few tricks. If you want to make good pasta using a machine your strips of dough should be kept similar in terms of their width. The strips should also be floured well so that when you pass them through the rollers they do not stick. When the cavatelli comes out on the other end, toss it with flour once again before placing them on a baking sheet. You do not want it sticking together. Your cavatelli machine can be cleaned the same way you do with any other pasta machine. Use a clean cloth or brush to clean off any dough that may be left sticking on the machine. The one thing that should never be done is to immerse the machine in water. Check out the three best cavatelli makers currently in the market. If you are looking for authentic stuffed pasta, turn to the Fante’s Cousin Elisa’s Cavatelli Maker Machine. This machine is designed to form and cut a lot of cavatelli pasta with a shape that is just right accompanied with the texture that will hold whatever sauce you will use with it. This machine is made to create homemade cavatelli that is uniform in size and tastes better than anything else you have eaten. The cavatelli pasta maker comes equipped with a clamp to help you secure it to the countertop. However, it’s important to flour your dough well to avoid getting it stuck on the gear. Then you should run it accordingly to get perfectly shaped cavatelli. True, this HIC Harold Import Co. item involves a comparatively difficult learning curve, meaning that, you’ll need lots of practice to prepare your pasta from this vintage machine. Still, the way this inexpensive model encourages making of multiple items at home, there’s little chance to complain about its performance. Constructed out of quality wood, the unit maintains a certain mass and thereby, ensures a stable position while rolling the gnocchi. And once you’re done with the dishes, cleaning is a cakewalk. Finally, with your brand new machine, you will get the clamp, a set of instructions, and some recipes. The Cucina Pro Cavatelli Machine is designed to help you make pasta sea shells that are the closest to the traditional thing. The machine still sticks to the original design, comes with instructions on how to use the machine and some recipes. When you buy your pasta maker, you will notice that the hand crank is reversed. This is made so that it can fit into the box. You can easily turn this around with a thumbscrew provided. Versatile in its usability, this cavatelli maker helps to make pasta, seashells, gnocchi, and what not! Straightforward to use and clean, its stunning stainless steel structure is perfect for cooking delicious recipes. It’s easy to use. However, while working on it, keep your fingers safe since the handle is located closer to the clamp. One thing to note – you must prepare the dough little bit stiffer than usual. Otherwise, it may fail to produce the pasta in your expected shape. No cleaning issue means you can use the maker without worrying about the future hassle. And due to its compact size, you can fit it anywhere once done. The downside? A few users found its hard plastic made rollers disappointing, thinking that wooden one would be a better option. Professional grade, this Cavatelli Maker by King Cole is manufactured keeping both the domestic and commercial use in mind. The rollers are non – sticky and don’t let the flour dough cling while working. 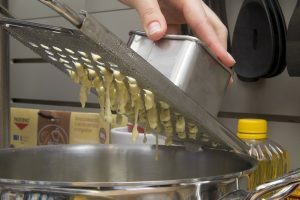 To make the process unfailing and smooth going, make sure the dough isn’t excessively drenched and dry enough to prepare a large amount of cavatelli in one go. Another good thing about the unit is – it’s straightforward to use, and both the amateur and DIY enthusiast can hope to get a better result consequently. The few uncomplicated steps you require to follow are – smoothening the pasta, cutting them in small shreds, sliding into the rollers and finally, the machine will keep on cranking out beautiful cavatelli. Having your dough in proper texture and consistent shape are the prime keys, though! In terms of taste – you will love its savory flavor, meaning that, no compromise with quality is ensured. And since there’s little concern associated with cleaning the unit, you can take the liberty to sprinkle a sufficient amount of flour over the cavatelli to avoid unwanted stickiness. Besides, rinsing with water is not mandatory. Merely wiping it out with a dry cloth is enough to store it for future use. Only a few models come with the feature of working with both whole grain and gluten free flours, and fortunately, this Cavatelli Pasta Machine by MAMMAMIA falls to this category. Using this professional grade Italian device is very easy. Start with setting it on a tabletop, and then fasten it tightly with the clamp to ensure utmost balance and firmness. It’s versatile and can produce both flat and ridged kinds of pasta. Putting the pasta roll in the middle area of this cavatelli maker, you’ll get half flat and half ridged pasta. Therefore, it’s essential to choose either the inner or the outer side of the roller to go for any specific type. The included 8 recipe books make it a thing of joy for food cravers. However, the only language available is Italian, so that may not be comfortable for worldwide use. Other than that, their presentation in a gift box adds a legacy to the idea. And after you’re done with cooking, no matter what recipe you’ve prepared, cleaning the machine won’t be a difficult task. Its easy to clean formula involves simple scrubbing with a knife or any other pointy stuff like the toothpick. After that, wiping it with a damp rag will be enough for lasting service. Cavatelli is smaller in size than pasta and can take a wrong turn if you pick the wrong machine for the purpose. That being said, having a well thought out design, the Paderno World Cuisine Cavatelli Maker is ready to serve you out of the box. It’s a great time saver and can produce bunches of perfectly shaped cavatelli in no time. Talking of its structure – the device is plated with aluminum for outer protection while the inner area has got stainless steel blades that are way too good in cutting the flour dough in cavatelli shape. The ABS rollers simplify the unit’s workability making it more comfortable and nuisance free for having your homemade pasta ready. Unlike other fragile items available out there, it won’t break down after a certain period of time. That is, its sturdy construction is meant to last longer with the same amount of durability that any new model offers. On to the cleaning issue – it takes absolutely no toll to remove the residual flour stuck with its rollers. Thanks to its non-stick finish, you can get it clean solely by washing with warm water. Not recommended for dishwasher, though! Cavatelli makers are one of those appliances that necessarily need not be in your kitchen collection. But when you’re a cuisine aficionado, more specifically, about Italian dishes, owning your personal cavatelli maker would be a satisfying idea. So, if you’re like us and love to treat your guests with homemade cavatelli any time, you must consider purchasing any of the above mentioned machines we reviewed in this article. 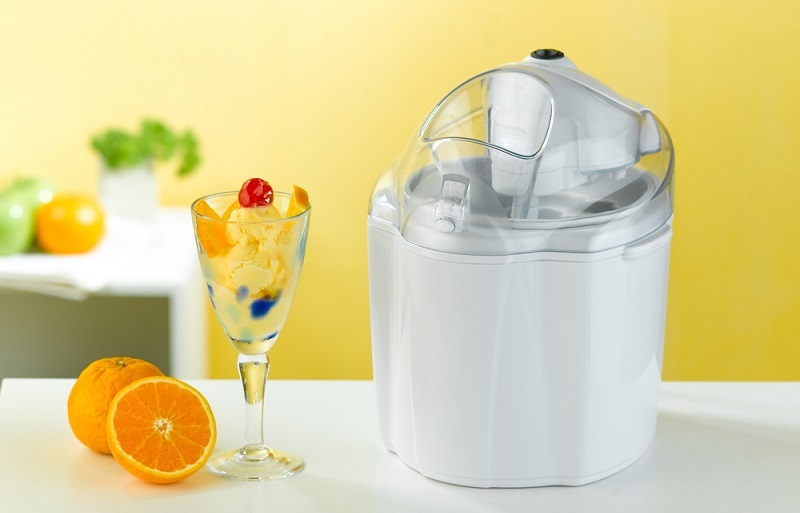 The features you should target to meet are easy of use, straightforward cleaning, ergonomic construction, and the speed! What is The Best Gelato Maker in 2019?